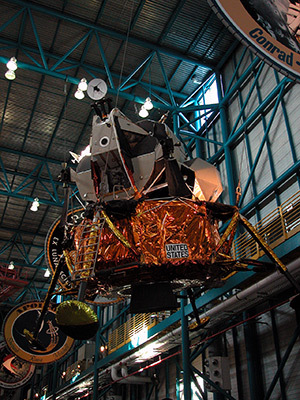 — For more than 20 years, Lunar Module 9 has been in a state of constant flight. Now, it has finally come down for a landing — and for a closer view by the public. The Kennedy Space Center Visitor Complex on Monday (March 25) announced the relocation of the authentic Apollo-era spacecraft, from its ceiling suspension to the ground, as part of an on-going revamp of the Apollo/Saturn V Center in Florida. The Space Coast attraction is being prepared for the Visitor Complex to celebrate the 50th anniversary of NASA's Apollo 11 moon landing this summer. "In celebration of the 50th anniversary, visitors to the Apollo/Saturn V Center will be met with a host of additions and enhancements as it is reimagined with a renovated 'sense of arrival' that includes revamped landscaping, thematic signage and more, setting a new tone for the experience," Visitor Complex officials said in a statement. 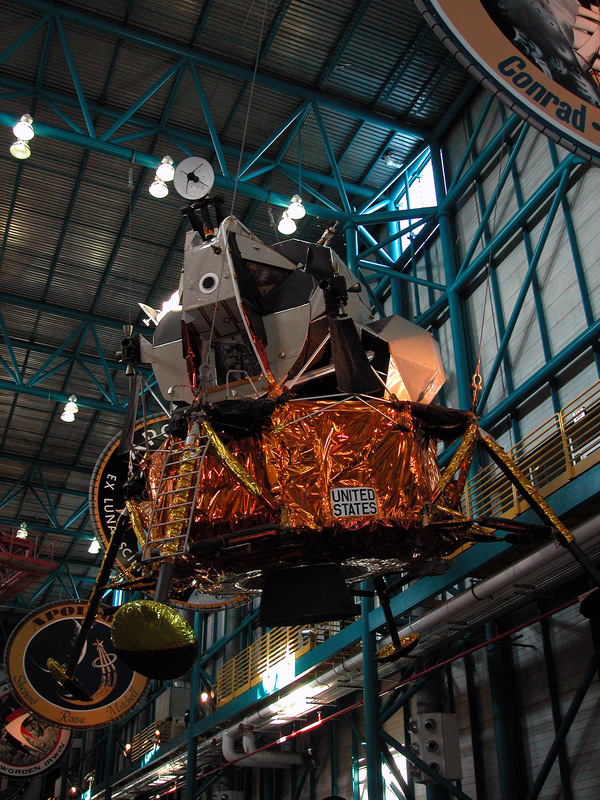 Lunar Module 9, or LM-9, is one of only three remaining Apollo moon landers built for mission use. Originally intended to launch on Apollo 15, LM-9 (pronounced "Lem-Nine") was replaced with a more advanced lunar module when the Apollo 15 mission was replanned to stay longer on the moon and a lunar roving vehicle (or lunar rover) was added to the flight. Ultimately, LM-9 was left without a mission to fly and became a museum artifact, eventually going on display with one of the last three existing Saturn V rockets when the Apollo/Saturn V Center opened in 1996. For the next two decades, the lunar module was exhibited hanging over visitor's heads, where it could only be seen from afar. LM-9 underwent a refurbishment in 2017 to preserve it for years to come. The lowering of the spacecraft took several hours to avoid any possibility of damage. When LM-9 debuts in its new display, it will be at eye level, providing the public an improved view of the four-legged lander. 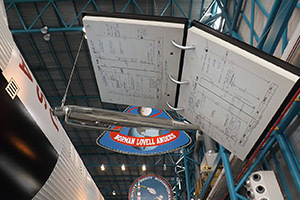 Other changes to the Apollo/Saturn V Center include the move of Command and Service Module 119 (CSM-119), which in the early 1970s stood ready to launch as a crew rescue vehicle for the Skylab orbital workshop, and a new display tracing the legacy of the Fisher Space Pen. The Center's Lunar Theater, which recreates the final moments of the Apollo 11 moon landing using scale replicas, NASA film footage and archival audio, will also gain a new entrance. "Guests will be transported back to 1969 as they step into a period living room recreation to experience what it was like to watch the moon landing," officials with the Kennedy Space Center Visitor Complex said. The enhancements also comprise an enriched "Touch the Moon" lunar rock exhibit and a "Moon Tree" garden featuring living trees grown from seeds flown on Apollo 14 to the moon in 1971. 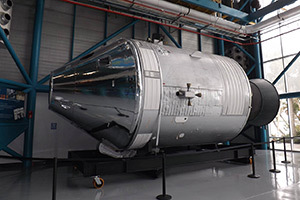 A grand reopening of the Apollo/Saturn V Center is scheduled for Sunday, July 14, two days before the 50th anniversary of the Apollo 11 launch.